I love history; it forms the basis of my interest in genealogy and has an influence on our itinerary when on family holidays. The first of many novels by her and a great read as it's based on her life and therefore gives a good insight into what made her who she was. 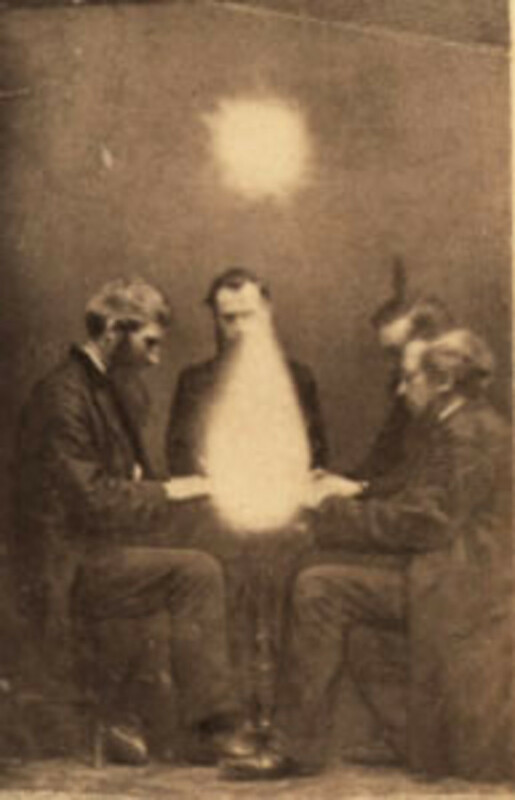 A paperback book of Ruth Hall, the first novel written by Fanny Fern, is essentially her autobiographical giving a scathing portrait of her father and other family members. Fanny Fern (1811-1872) was a prominent 19th century American woman newspaper columnist who wrote on social issues; her real name was Sarah Willis. She was born in Portland, Maine, America and her parents were Nathaniel Willis, a newspaper owner, and his wife Hannah Parker. She is of particular interest to me because of my interest in genealogy and Victorian history, particular as this was the era when my great-great grandfather was born and lived. I discovered her works and learnt about her by reading through my great-great-grandfathers scrapbook where he has saved several articles published by her which I find fascinating to read because they give a real insight into everyday life as it was in America during this golden age of exploration. Below is a sample of her works and links to the full transcripts I made from the articles passed down to me. 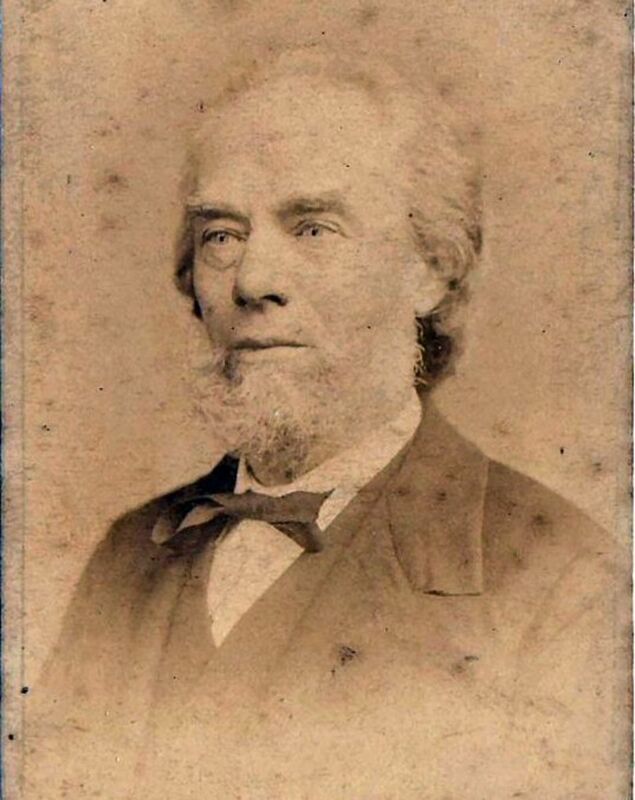 Pictured above is my great-great grandfather George Burgess (1829-1905) born in Bristol, England. Over a 12 year period between 1845 and 1857 George Burgess spent a lot of his youth living in America, briefly returning to Bristol three times during that period to visit his ailing mother. 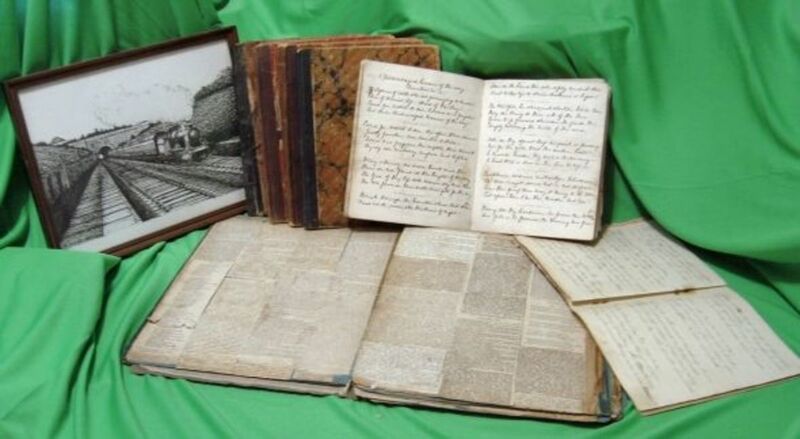 During his time spent in America George Burgess saved five of Fanny fern’s newspaper articles in his Victorian Scrapbook which ultimately contained over 500 Victorian Era newspaper articles from both Britain and America. Fanny Fern (1811-1872), born Sarah Willis, was first married to Charles Harrington, a banker; they had three children. Their eldest daughter died of meningitis in 1845, age about six and shortly afterwards her husband died of typhoid fever leaving her, without support from her family, nearly destitute. She remarried in 1849 to Samuel Farrington, a merchant, but that didn't work out so they divorced two years later. 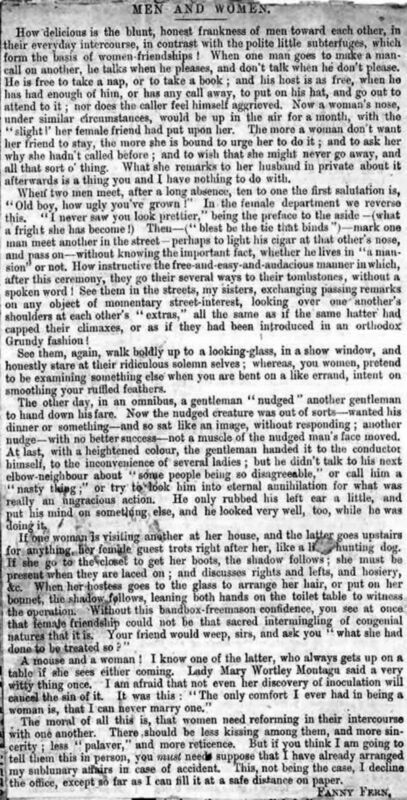 Fanny Fern published her first article 'The Governess' in 1851 in the ' Olive Branch', a weekly paper published in Boston, Massachusetts, America, followed by several short satirical pieces. Shortly afterwards she began using the pen name 'Fanny Fern'. 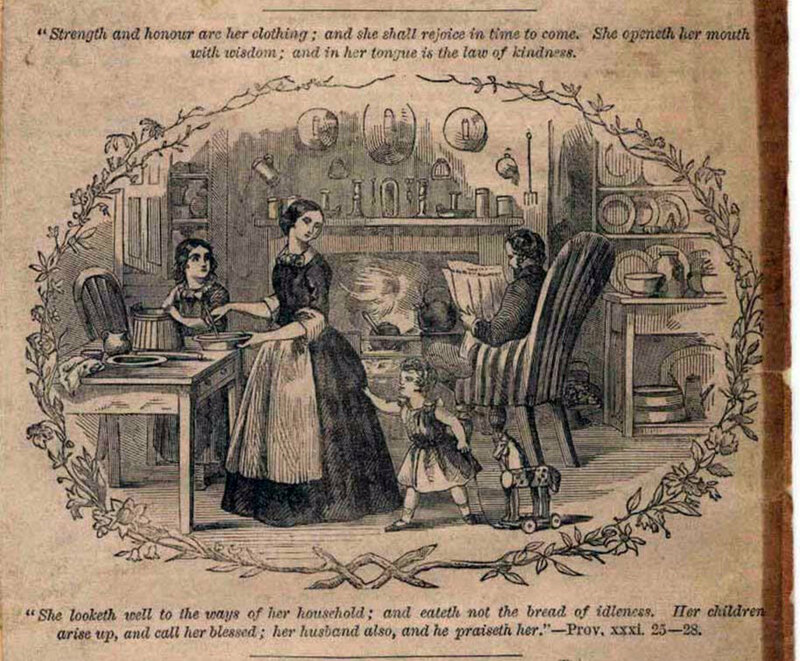 With no regular income and two children to support Fanny Fern started writing in earnest but her brother (a magazine owner) refused to publish them claiming they would not have any appeal outside of Boston. However other newspapers and periodicals in New York and elsewhere outside of Boston did begin printing them and in 1852 she became the first woman to have a regular newspaper column. It was at about this time that publisher 'Oliver Dyer' hired her to write exclusively for his New York newspaper, the 'Musical World and Times'. The following year Oliver Dyer helped her find a publisher for her first two books; and from there she went on to publish a number of children's stories for next two decades. 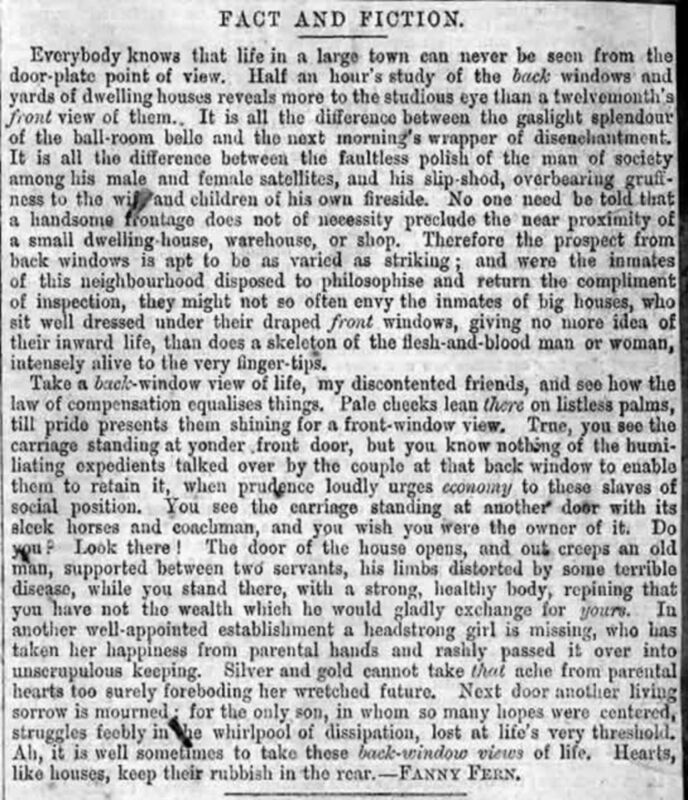 FACT AND FICTION is a short newspaper article by Fanny Fern that basically says you cannot tell a book by its cover although the analogy she uses is the ‘back window view of life’ rather than the ‘front window view’. By this she means that looking at the front of the house, no matter how splendid it may look and how wealthy the occupants may appear to be, appearances can be deceiving. The occupants may be old and frail, they may have domestic issues with their children or marital issues or they may be finding it financially difficult to keep up the charade of their wealthy lifestyle; while you, who may not live in such a glamorous house, may be healthier, fitter and younger, and a happily married person living within your means. She concludes by saying that it is sometimes good to take the back window view of life in that like the heart, houses keep their rubbish in the rear. 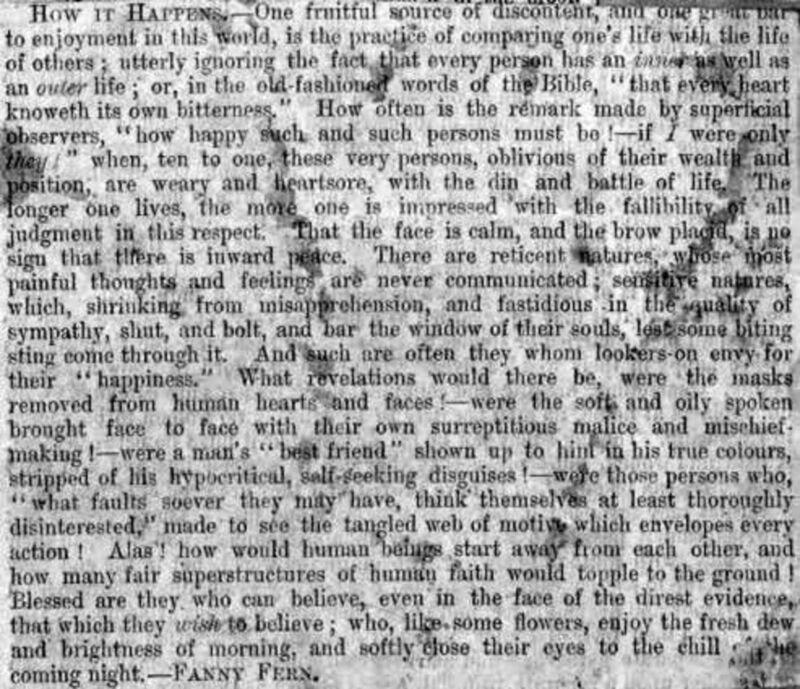 In Fanny Fern's newspaper article HOW IT HAPPENS she talks about people's discontentment and their barrier to enjoyment in life through the folly of comparing their own life with that of others, while at the same time ignoring the fact that many people hide their true feelings and thoughts so how people appear outwardly may not be how they truly feel inwardly (inside) e.g. under the Facade of their mask. THE TRAGEDY OF INDULGENCE is a Lengthy newspaper article by Fanny Fern where she discusses the tragic over indulgence of mothers towards their daughters by protecting them from life rather than preparing them for life. 'My verdict after visiting a Lunatic Asylum is, that there are quite as many people outside, who should be in, as those already there. In other words, that almost everybody has some crazy streak that should serve as a passport quite as well as any doctor's affidavit. Reading Fanny Fern's findings in her newspaper report on her visit to a 19th century American lunatic asylum it sounds as if the Americans where way ahead of the British in the humane treatment of the mentally ill. Having learnt a lot about Victorian mental institutions from my interest in genealogy, in Britain people considered mentally ill were treated a lot worse and a lot less humane than in America; and there was little change in England to this system for almost another century. 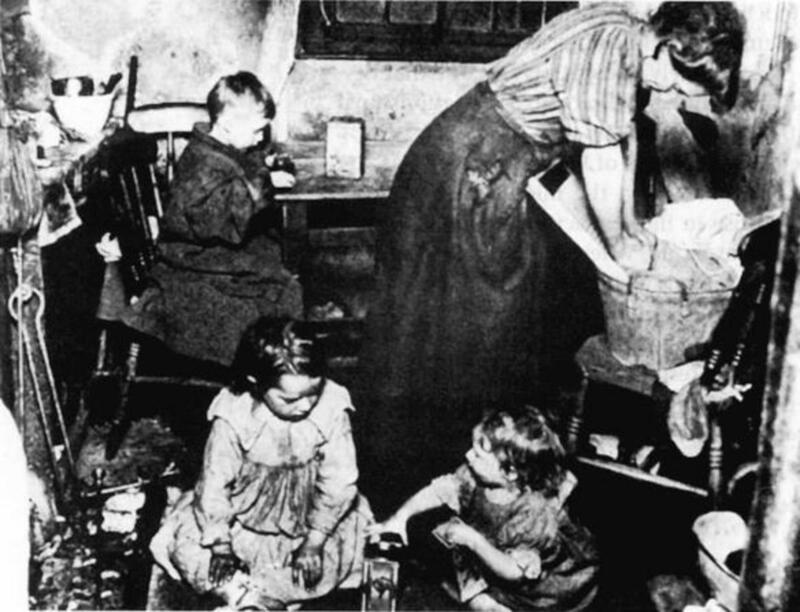 In Britain right up until the 1950s people, predominantly women e.g. single women getting pregnant in their teens were all too often committed to mental institutions for the flimsiest of reasons, and often for life. A prime example being Lady Harriet Mordaunt (1848-1906) born in Scotland and who married Sir Charles Mordaunt, baronet and Member of Parliament. 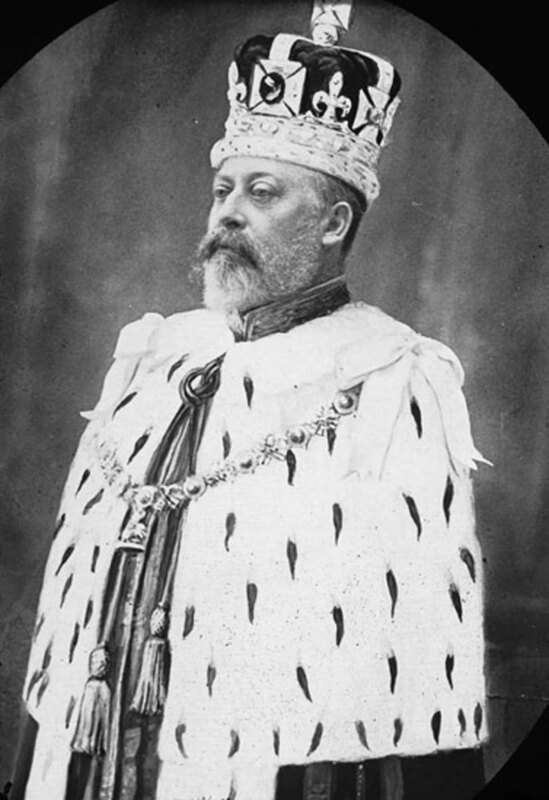 Following a scandal where Lady Harriet Mordaunt had affairs with the Prince of Wales (later to become King Edward VII) and others her husband tried to divorce her. But following a counter claim by her family that she was mentally insane and unfit to plead in her divorce case the jury in the resulting trial found her to be mentally ill where upon she was committed to an asylum for life. "The only comfort I ever had in being a woman is, that I can never marry one." 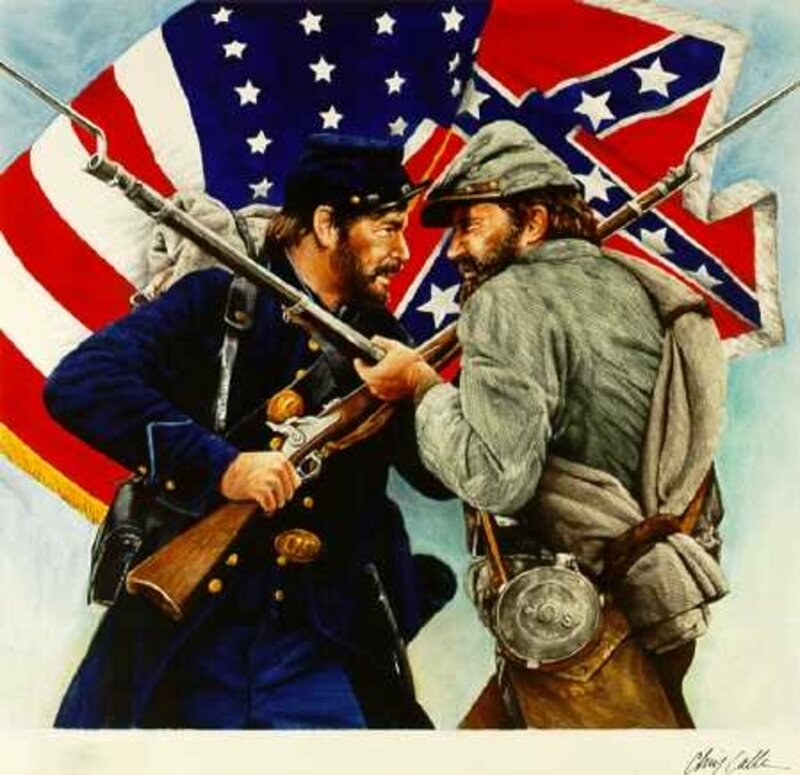 View the full transcripts and original newspaper articles by Fanny Fern on my Nathanville genealogy website. A selection of reading material that gives an insight into America society, and the lives of famous American authors, in the Victorian period. An insight into the lives of American new heiresses who post-civil war were shunned by the established American aristocracy looked to England to find themselves a husband from amongst the British aristocracy; paperback book. An introduction to American history through the eyes of Mark Twain in a paperback book intended for younger readers. From the reviews of the five American newspaper articles above written by Fanny Fern which did you find the most informative. Which of the five articles reviewed above did you find the most informative? Thanks ismeedee; yes you may well have a point; especially with the insanity of some of the politics in free democratic countries these days, voters certainly can be fickle. Wow, I found this so fascinating I'm going to have to come back and read more! I love the story of finding the saved newspapers from your grandfather (felt a little connection being from Mass. and now living near Bristol). I laughed so hard when I read the article on the asylums: 'more people outside that should be inside'!!!! Great stuff! Angel Blessed!